Sometimes, there is no better salad than fresh, cold cucumbers simply dressed with yogurt, salt and olive oil. I prefer goat yogurt but any will do. After trying sun pickled cucumbers the first line goes like this: There is no better salad than sun pickled cucumbers eaten plain from a jar. Believe me, sometimes there is really nothing better than having a jar full of 'tanned' cucumbers. It was early September, years ago, hot and dry summer. A huge jar was placed on a forth flour terrace. Green cucumbers were sunbathing! Father of my good friend, alias uncle Voja, keeps homemade delis on his terrace. Nowadays there are jars, different size jars, loaded with green fresh Kirby cucumbers. 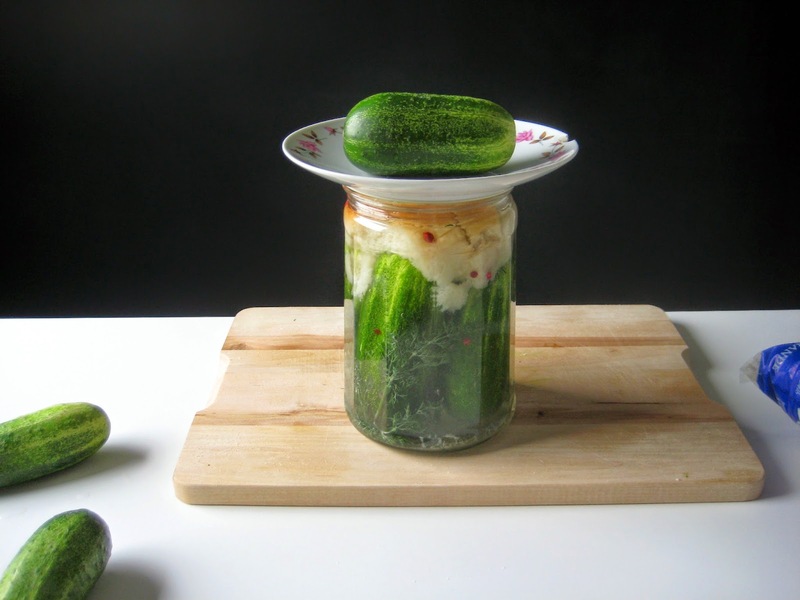 Sun pickled cucumbers made by uncle Voja are the BEST and a MUST for this summer season. Therefore you will need: tap water, coarse salt, cucumbers, bunch of dill, peppercorns, bread, knife, jars, saucer and the Sun. Uncle Voja’s advice: You must wait for the Kirby cucumber season, which is now, and when choosing make sure they are almost the same size. Always perform specific cut to each cucumber. I am doing a cross cut but not all the way down, so that the brine can get inside the cucumber. Dissolve one tbsp of coarse salt in one liter of tap water. This is a right proportion but I always add just a bit more salt. It takes only 3 days for cucumbers to pickle, and make sure you add enough bread. 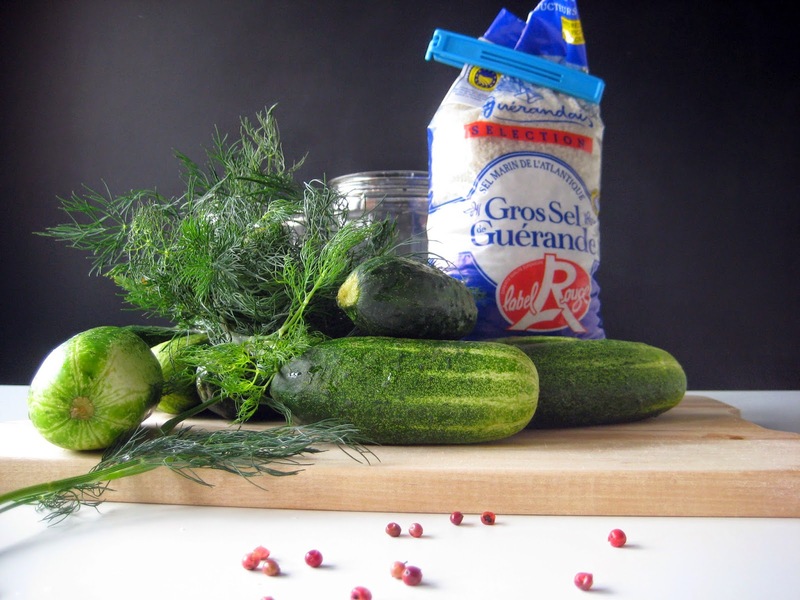 I use only dill and peppercorns for seasoning. 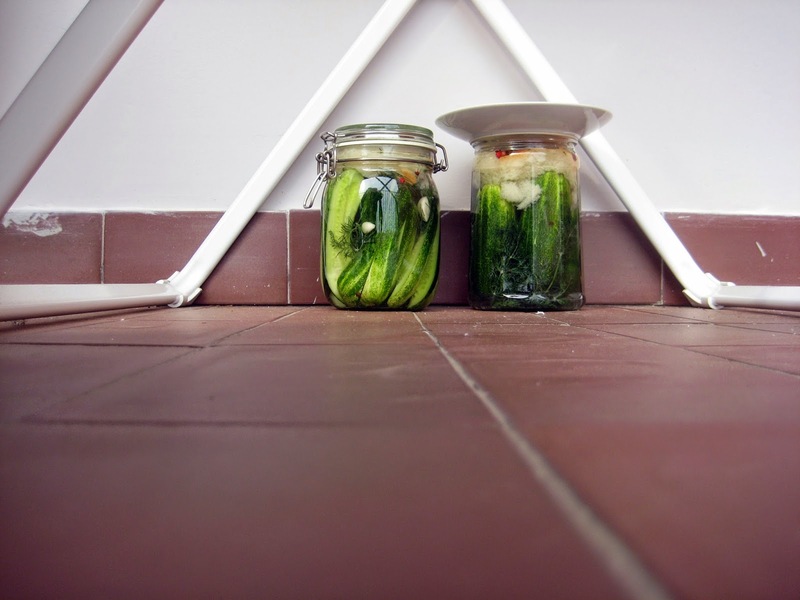 I made one jar following blindly uncle Voja’s recipe, and one jar adding cloves of garlic and quartering cucumbers. For these two (one liter) jars I used 1l of tap water, one tbsp of coarse sea salt, big bunch of dill, 3 slices of bread (roughly chopped), few cloves of garlic (for one jar), red peppercorns and 9 almost same size Kirby cucumbers. I was able to put only 4 whole (cross cut) cucumbers in one jar and those other 5 I quartered and placed in another jar. 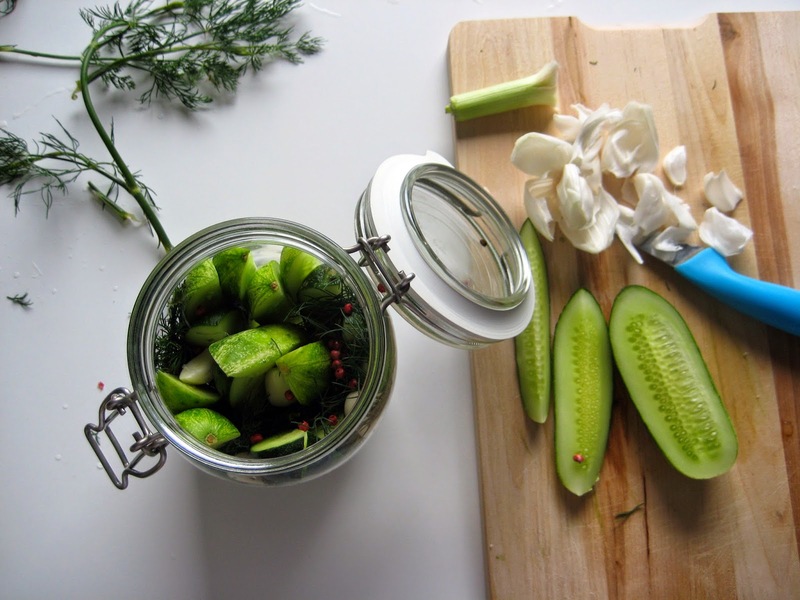 Place cucumbers in a jar and season with peppercorn (garlic) and put dill inside as well. You can use whatever seasoning you prefer. Pour over salty solution so it covers cucumbers. Place bread on top. Cover with saucer and make sure there is some space left between bread and saucer, so when fermentation starts there is no worry that there will be an explosion! After three days of sunbathing, they are ready. 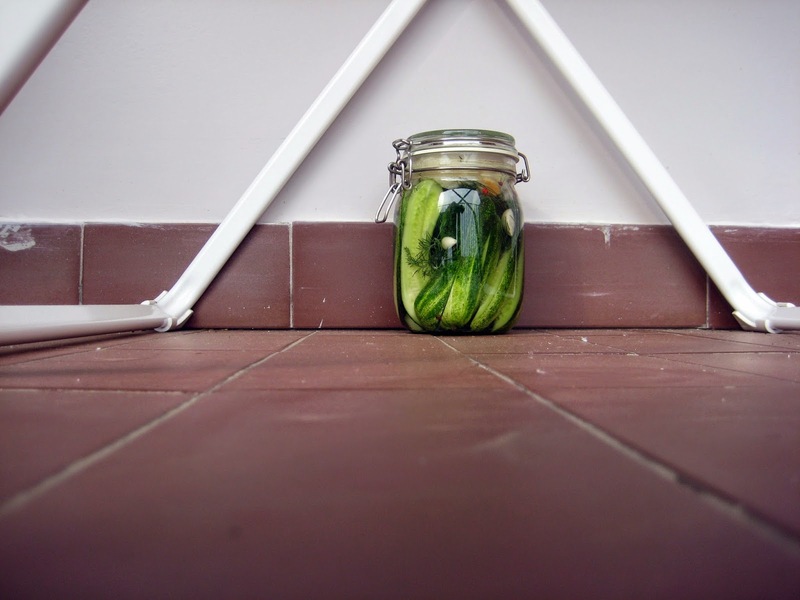 Strain and keep the liquid, as you will put cucumbers back in the jar and cover with this brine. Store jars in the fridge. You can consume cucumbers immediately but after cooling for few days they taste even better.